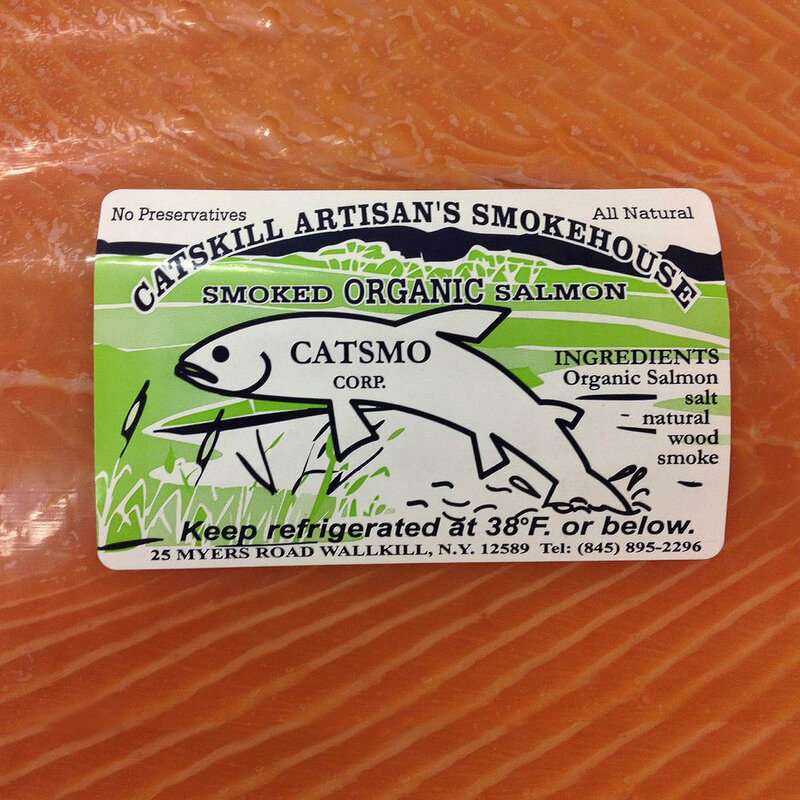 Located in the Hudson Valley of New York, Catsmo Artisan Smokehouse has been smoking salmon for over 20 years. The salmon we use is always fresh and never frozen, giving it a uniquely silky texture, and deep orange color. The salmon is cold-smoked or hot-smoked on fruit or oak wood, depending on the flavor. Our salmon is sourced from the best aquaculture farms around the world. The salmon we use has never been frozen, giving it an amazingly silky texture, and rich, deep orange color. Our Gold Label is what made Catsmo what it is today. With its rich, buttery texture and sweet lacing of fruit-wood smoke, it accounts for 80% of our sales. Smoked with the perfect blend of apple and cherry woods, our salmon is praised for its delicate smoked flavor and silky texture. Our salmon comes from the best aquaculture farms in the Shetland Islands, off of the coast of Scotland. The salmon we use has never been frozen, giving it an amazingly silky texture, and rich, deep orange color. Renowned French chef and restaurateur Daniel Boulud is celebrated for his exquisite cuisine among fine dining connoisseurs across the world. Catsmo Artisan Smokehouse teamed up with Chef Boulud to develop an extraordinary line of custom smoked salmon. Each recipe was tested and perfected under the leadership of Daniel Boulud, and today his wonderfully smoked Atlantic salmon is one of our top sellers in the Daniel Boulud Kitchen line. Flown in from the best farms in Scotland for Catsmo, this buttery salmon is scotch cured and smoked using oak, as opposed to fruitwoods. 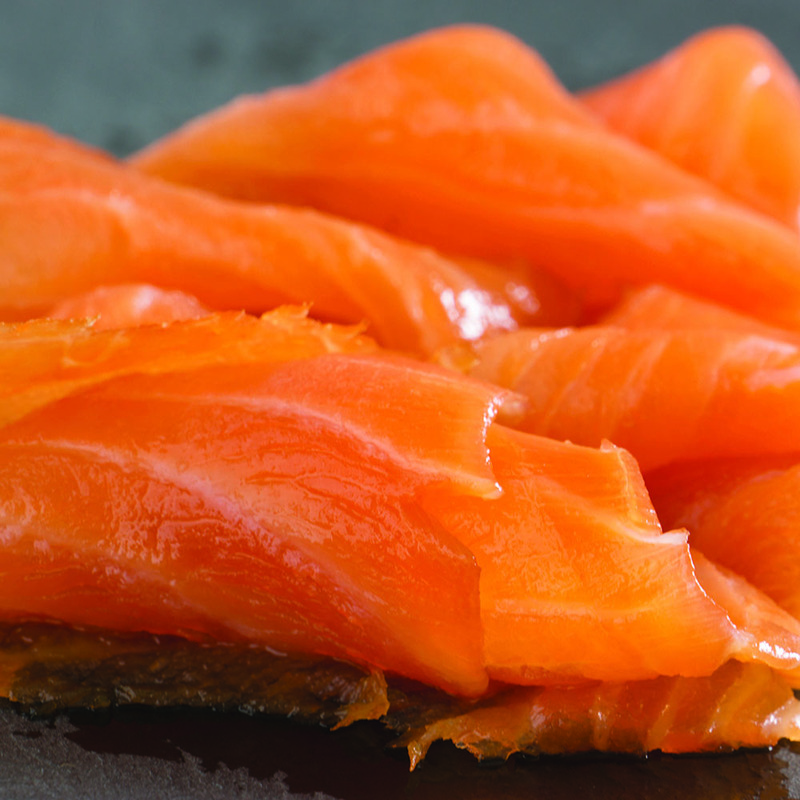 Our Candied Smoked Salmon redefines the protein snack! Catsmo Artisan Smokehouse has a tradition of excellence that includes time-tested recipes and hands-on artisanal practices of smoking. Skillfully smoked in small batches, our all-natural, sustainably-raised fresh–never frozen–salmon is cured with locally-sourced, organic Crown Maple® syrup infusing the salmon’s tantalizing smokiness with a sweet maple flavor. The word Balik is Russian, literally meaning, the best part of the fish. At Catsmo, we call it tenderloin or center cut. The quality is superior because the thick flesh of the fillet absorbs the salt and smoke to produce the most harmonious blend of flavors and silky texture, which melts in your mouth. Very lightly smoked, buttery, sweet, and meltingly rich within, the tenderloin cut was originally created for Russian Tsars. It is truly perfect in every way. Tenderloins are typically served sashimi style, cut in thick, oval-shaped slices. This smoked masterpiece is often enjoyed with some caviar and crisp brut champagne. From an organic farm located in Ireland, these salmon are raised totally organically, no chemicals, antibiotics, or medications and fed with only organic food. Organic Salmon has evolved with today’s marketplace specifically to fulfill the unqualified perfection that nature intended – the unsurpassable 100% organic salmon. Nothing less than the absolute best is nurtured to maturity in some of the most remote salmon farm sites in the world, lying within the most pristine waters of Ireland’s magnificent and rugged coastline, windswept and storm tossed for much of the year. With our own blend of Pastrami spices, this specialty is well recognized as the best Pastrami smoked salmon in the country. 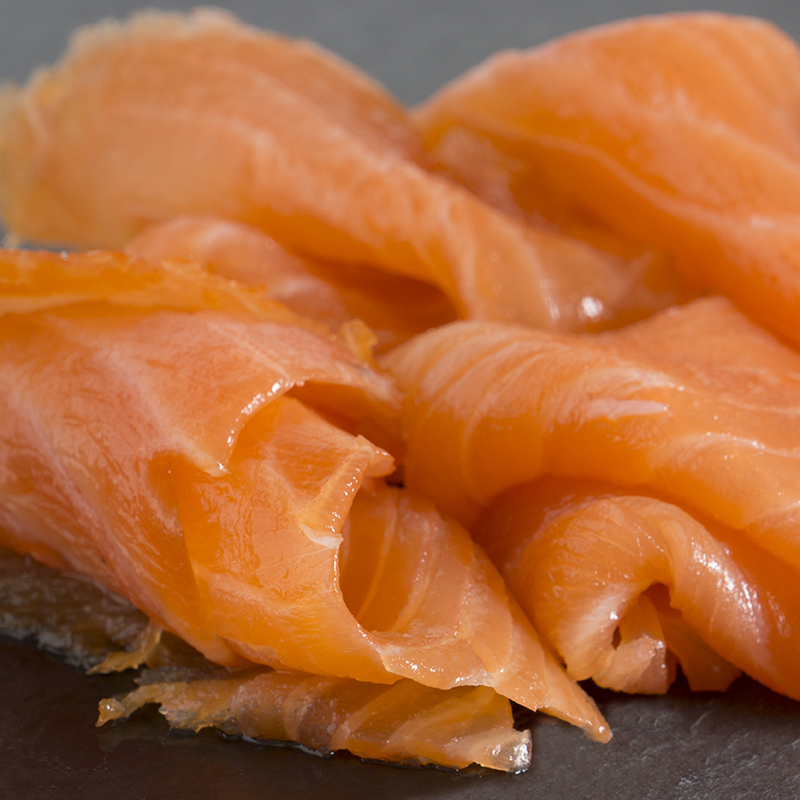 This special consists of our traditional Scottish smoked salmon, cured with a delicate mix of spices. As seen in the picture, only the top is covered, leaving the rest of the salmon with its original deep orange color. 12-Year-Old Single Malt Scottish - Scottish salmon cured with 12-year-old single malt Scotch whiskey and smoked with oak wood. Bourbon & Pepper Smoked Salmon - Made with our silky Scottish salmon, this conception is cured with American bourbon and sprinkled with freshly ground black pepper. Vodka & Dill Smoked Salmon - Cured with Russian Vodka, smoked, and then covered in finely chopped dill. Tequila & Cilantro Smoked Salmon - Cured with Mexican Tequila and then covered with fresh cilantro. Tanqueray & Spices Smoked Salmon - Cured with Tanqueray Gin and a mixture of spices. Vodka & Lemon Pepper Smoked Salmon - Cured with vodka and then covered with a lemon pepper spice mix. Pastis & Annette Smoked Salmon - Cured with Ricard (French anise liquor) and covered with fennel (sweet anise) fronds/tops.